Ananka's Diary: Is THIS a Chupacabra? Since 1987, chupacabras have caused a sensation across much of Latin America and the Southwestern US. The legendary beasts have been blamed for the gruesome deaths of thousands of pets and farm animals. 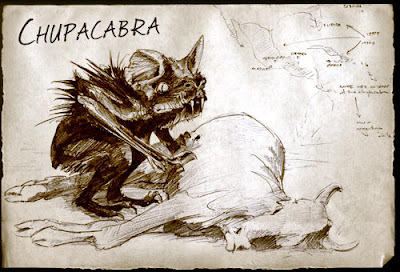 When the chupacabra's victims are discovered, it's said that they've been drained of every last drop of blood. It's this unsettling detail that gave rise to the creature's name. In Spanish, chupacabra means "goat sucker." In recent years, a number of strange-looking creatures have been captured in areas plagued by unusual animal deaths. Though they don't resemble the classic description of a chupacabra, which is said to be "the size of a small bear, with a row of spines reaching from the neck to the base of the tail," they're unusual nonetheless. They resemble hairless dogs, with a blue tinge to their skin and protruding fangs. Just last month, a rancher from Cuero, Texas discovered the bodies of three such creatures near her property. She's convinced they were responsible for a rash of chicken deaths. And since the chickens had all been drained of their blood, the rancher believes that she may have found the beasts behind the chupacabra legend. I've heard that chupacabras were the works of mothers trying to get thier children to come in for supper. Maybe. Hey, I love kiki strike.com! I was one the only ones who knew about this at school! Awesome. KEep posting good stuff u guys rock:) Some people say this is just a form of hairless coyote! Who knows?